If you haven’t been to a WSU Lewis County Master Gardener Plant Sale, you don’t know what you’ve been missing! Thousands of plants, all grown by Master Gardeners, include over a thousand tomato plants with nearly 40 varieties, including many heirloom varieties. Other plants include annuals, perennials, vegetable starts, berries, herbs, shrubs, native plants and much, much more. In addition to plants we have lots of great garden accessories such as bird and bat houses, mason bee blocks, planter boxes plus raffle items. Classes and Workshops – Free classes on a wide variety of subjects. Gardening for Everyone – Held at Centralia College. 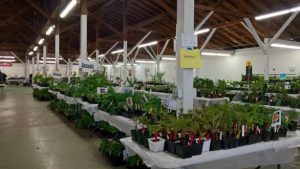 Plant Sale – Thousands of plants all grown by Master Gardeners. Learn how to divide, plant and grow Dahlias. Learn a technique to make your backyard and orchard flourish. Selection of the best blueberry plants for your area, care and how to prune. Thousands of plants all grown in Lewis County by local Master Gardeners. Select from over 1,000 tomato plants including many heirloom varieties. Other plants include annuals, perennials, shrubs, trees and much, much more. Credit & Debit cards are accepted forms of payment. Oh those spiders some of us scream and some of us just ignore them when we see them in our garden. This workshop will teach you how beneficial these eight legged creatures are. Learn how to grow lavender and how to make lavender wands and sachets. Hydrangeas are a beautiful addition to any flower garden. Learn the secrets of changing color, caring for and pruning this beautiful and easy to grow ornamental shrub. This workshop will help you plan your winter garden that includes: colorful foliage, berries, and many plants that are overlooked for their fall contributions . Did you know that you may have plants in your yard that you can use to make dye? In this workshop you will learn how to dye fabric and yarn using plants and flowers that can be grown locally.